Skip and Bob and I had planned a return canoe trip to Spanish River, Ontario. When one of our canoe partners was unable to participate we decided to change our plans. Instead of a river trip involving some Class II white water we decided to go to Algonquin Park and do a loop trip through several lakes. This would permit me to use my Kevlar Wenonah Prism Solo canoe. We researched several trips and settled on a long river/lake trip that featured 10 portages including one of 9,000 meters. We thought the extensive portages would ensure a sense of remoteness. We selected a trip from Opeongo Lake to Proulx Lake to the Crow River to Big Crow Lake, continuing on Crow River to Lake Lavielle to Dickson Lake and finally the 9000 meter portage back to Opeongo Lake. Opeongo is Algonquin’s largest lake and when the winds are strong Opeongo can be impassable in a canoe. Following our 6 hour drive we elected to take the 2pm water taxi across Opeongo arriving at the portage to Proulx Lake. 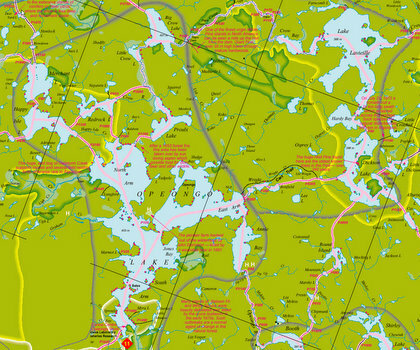 Proulx Lake is reached via a 1400 m portage from Opeongo Lake. The portage begins with a sharp climb up a knoll between two swampy areas, then levels out and gradually descends to Proulx Lake. We carried most of our gear across the portage and returned to bring our canoes across using the canoe cart. We spent the 1st night on a heavily used campsite on windy peninsula populated by many, many red squirrels. The wind abated as the night went on and it got cool at night. We saw eagles and heard loons through out the night. The next morning was a special sunrise through the mist. Day Two we left Proulx Lake via the northern section of the lake which merges with the meandering oxbows of the Crow River. We arrived on Big Crow Lake to waves showing whitecaps. Big Crow Lake is quite scenic and was an obvious place for us to break for lunch. There is an abandoned ranger’s cabin near the southernmost tip of the lake which can be rented. From behind the cabin a steep trail leads to the top of the high granite bluff overlooking the narrows between Little and Big Crow Lakes. The hike to the top took about 15-20 minutes. The view over the hills and lakes to the north was well worth the climb. Leaving Big Crow Lake was a little dicey as the winds and waves had continued to increase. We paddled quartering up wind well above our destination, executed a quick turn and paddle-surfed quartering back down wind into the Crow River. The tandem canoe took a little water and at times I had to stop paddling my solo and merely rudder to re-gain directional control. All’s well that ends well, but we gained a healthy respect for big lake wind and waves. There were three portages along the Crow River: a 240 m portage, a 350 m portage and finally a 1200 m portage through a white pine forest on a good trail. As we double carried the portages we were joined by a young couple who had been tailing just behind us most of the day. They were headed for a campsite at Crow Bay, but as the day was wearing on it was obvious they weren’t going to make it, so we extended an invitation for Stewart and Angela to join us on our reserved site along the Crow River. That night we all shared a hearty meal of chicken, potatoes, and onions superbly cooked by Bob and due to our extra guest we, for once, weren’t arguing over who had to eat more. We turned in early on a warm evening. The next morning we arose at 6:30 as Stewart and Angela were departing – bound for Dickson Lake (a long haul). We had a leisurely breakfast of oatmeal and heard a wolf howl followed by 3 sharp barks. Going downstream there were four short portages ranging from 100-203 meters that were uneventful except for a mistimed launching by Skip & Bob that caused everything to go swimming. Coming into Crow Bay we paused on a large rock on the southern shore of the bay for a lunch of flat bread and peanut butter/jelly. About 2pm we pulled into Lake and camped on a beautiful site at the entrance to the lake from Crow Bay are superb. After a cleansing swim we set up tents and a rain tarp to ward off the threatening thunder clouds. After dinner we attempted field repair on my water filter which seemed to have an inoperable footer valve. With our repairs to no avail I pumped water using my thumb to seal off the exit on each pump. The rain moved through around 9pm and we sat under the tarp. We placed our collapsible water bucket under the eaves of the tarp and captured ~2 gallons of water by daybreak. With a break in the rain we scooted for the tents and a good night’s sleep. The next morning we aired out our tents and got a later start. In fact, too late as the NW wind was picking up on Lake Lavielle. Paddling on the main lake was dicey and we crept around the shoreline going point to point. We were greatly relieved to escape Lake Lavielle and pull around the corner into Hardy Bay and be out of the wind. Leaving Lavielle we made a short 90 meter into Dickson Lake where we had a late lunch on an island. At this point we were spooked enough by the wind that the thought of our return paddle on Opeongo Lake was a concern. It was suggested that we check out the 5.3 km portage from Dickson Lake to Bonfield Lake which is akin to going to the animal pound to “just look” at the puppies. The next thing we knew we had talked ourselves into doing the portage starting at 2pm. Commonly, people who single carry the portage accomplish it in ~ 2 hours. We had been double carrying our portages, but were hoping to utilize the canoe cart along a cart trail. The thought was that we could carry our packs and load up the canoes with the excess and move along the cart trail. Unfortunately the canoe cart did not perform when fully loaded – a situation we did not test at home. With empty or lightly loaded canoes the cart could be moved along at hiking speed. So we were resigned to double carrying and committed to the longer cart trail. At 9pm we finished our last load and set up our tents using our head lamps. We snacked on beef jerky and trail mix and chugged the last of our water. Sleep that night was uncomfortable as we were sticky from our exertions. The next morning I arose early and took a quick swim. Crossing over to Opeongo Lake was a short 300 meter portage. In taking to boaters we were informed the weather called for thunderstorms and winds of 50mph. We set up camp along the shore, made our wind breaks and lounged around swimming, playing cards, and snacking. We never received the thunderstorms, the wind died down at evening and we were rewarded with a gorgeous sunset. However, seeing the waves during the day we decided to make an early start the next day in order to paddle out on calm waters. We arose at 5:29 and by 5:55am we were paddling for the south end of Opeongo Lake arriving there 3 hours later. The trip was nice. Algonquin is close (~6 hours). Algonquin’s permit system ensures there are available campsites and the permit monies are used for campsite & trail maintenance. I was surprised at the number of canoeists doing this trip, despite the portages. We are thinking that a return trip in September might be a little less busy.